China Sea during the 1920s and into the 1930s. bracelets of the same precious apple-green stone. were intelligent…and rather hard. She was probably not yet forty. You can read more about Lai Choi San at In the Library of LadyViolet, as part of the Queens of the Sea series. It was kind of Lilius to describe her outfit so well, wasn’t it? 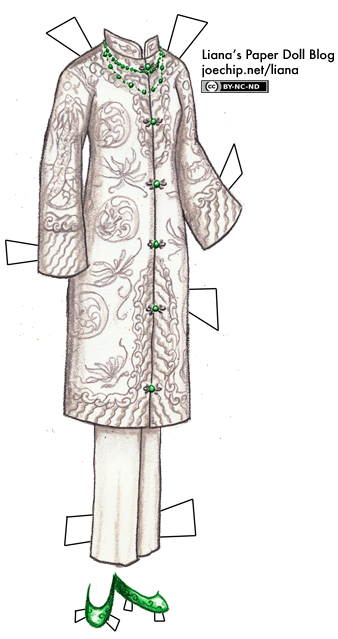 That made today’s overall design very easy to come up with, meaning that I could spend less time thinking about it and more time admiring pictures of 1920s-era vintage Chinese robes. I could have sworn that the word “necklaces” appeared in that description at some point, though. Oh well. I’m sure she had a least a couple of necklaces! Imagine trying to keep a white satin outfit like that clean anywhere near a ship… Even if it’s not what she might have worn on duty, so to speak, it can’t have been easy. I imagine that’s one perk of what was no doubt a generally rough existence — she could task some poor underling with the duty of keeping her clothes immaculate. Although, given that she may have never existed at all, I suppose a fantasy character could keep all manner of delicate white clothing perfectly clean. I wanted to clarify one thing about the first contest – it’s open to international visitors as well as domestic ones. And yes, all you have to do is post a comment to enter — although it is a little boring for me to watch the comments roll in, next time I do something like this, I will make people write something more imaginative! But I won’t change the rules on you mid-stream, this time. Don’t forget: check out the tour schedule here! And for more information about Random Magic, here’s the trailer for the book. How pretty! I love how the satin looks. It makes me want to touch it XD I’m already loving this series. Pirates make everything amazing. so cool to learn about this dragon lady. love the splashes of green in this outfit. Oh, she sounds like an interesting character…wouldn’t it have been nice to meet her? About this new outfit…it’s so Oriental, the design is just fabulous. Wow, it would have been nice to meet her! The outfit just seems to fit her perfectly! Wow, so pretty! I love the touch of green.